Disclosure: Our blog is participating in a sponsored blog ambassador program from Portable North Pole. As a part of this program we have received paid compensation for placement of digital advertisements and specific postings related to Portable North Pole. A couple of weeks ago I shared a bit of Christmas magic with you. It has been so much fun sending personalized video messages from Santa to my son, nieces, and nephews via the Portable North Pole (PNP) web site. Since then I have discovered more holiday fun with the PNP Mobile App and the Santa Sprint Game. Just like the Portable North Pole web site, the PNP Mobile App is very user friendly and gives you many different options to personalize your video. You can personalize by uploading images of the video recipient right from your mobile device. I captured some screenshots so you can see what it looks like. 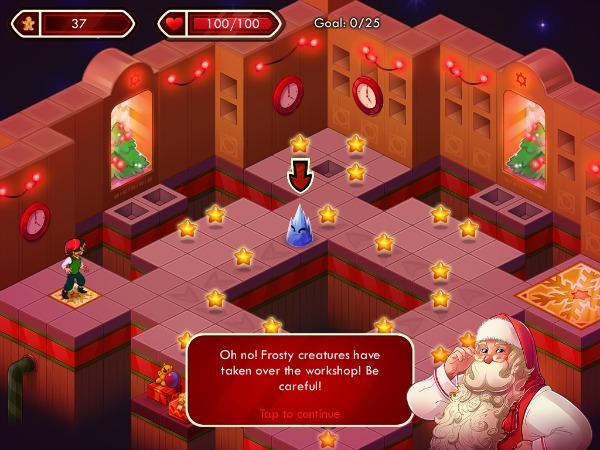 Portable North Pole offers iOS and Android users an application to create Christmas magic on their mobile devices. I seem to spend so much of my online time these days on my mobile devices, so it’s great to have the same online Portable North Pole options available on the go. 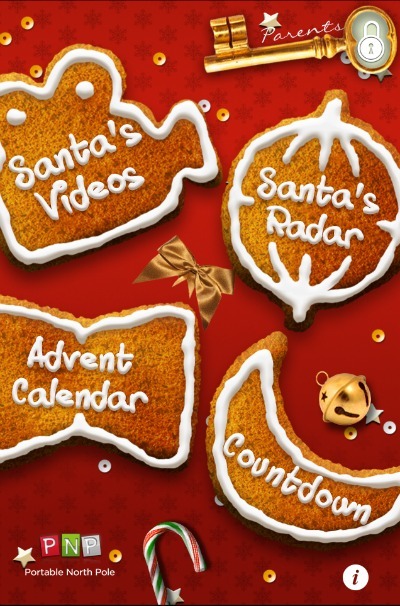 The newly updated PNP app includes: credit to create and access premium videos, call from Santa himself, an Advent Calendar game, Christmas Radar, Countdown game and access to a PNP account to synchronize with your online content. I found that the credit is enough to create 5 personalized video messages from Santa. I was able to start making my video messages while sitting at the airport in Atlanta, and finish them up on my PC at home. If your children sometimes use your mobile device, you will appreciate the PNP Parents feature which lets you secure your PNP account with a 4-digit password. That way you can be sure Santa’s message for you child is a big surprise. The Portable North Pole’s Mobile App is available for both iOS and Android: Retail: $3.99 for iOS and Android; $4.99 HD app for iPad and iPad mini. I am always on the lookout for fun holiday games for myself and the kids. The Santa Sprint game is so much fun. This unique Christmas adventure game is currently available to play on iOS devices and is the perfect holiday game for my family to play on our iPad mini. In playing the game you can help Santa get ready for Christmas. Santa even guides you and cheers you on as you uncover different levels of the game and unlock exclusive video stories. The PNP Mobile App and Santa Sprint game will provide hours of Christmas fun whether you are home or on the go. Portable North Pole brings the magic of Christmas to life in the hearts of kids and adults all around the world, making the holiday season more special than ever. Plus, I love that Portable North Pole donates 5% of all online sales to a Children’s Hospital close to the buyer’s location. PNP currently collaborates with over 40 regional Children’s Hospitals in the U.S.
Stay connected with Santa Claus PNP socially! Oh this is so cute! I’m glad the Portable North Pole available for Android. I’m going to get it, and make sure my daughter gets it for the grandkids. But the Santa Spint game is not for Android? Sorry, the Santa Sprint game is not available on Android yet. You’ll definitely have fun with the PNP app though. Looks fun! It’s nice to switch out some of the games and enjoy ones with a holiday theme! I like that you can stay connected with Santa! Must show this to the kids. My daughter loves both of these apps! How fun! My daughter is obsessed with games and Santa – a match made in heaven! First I’d have to get a smart phone. Looks like fun apps. This looks like a fun addition to all of the new holiday apps! This website is one of our favorites every year, but I didn’t know this was an app!! We have a week filled with dentist and dr. appointments and then a 3 hour drive this weekend to a relative’s! I am definitely downloading this app for my kids! They will be thrilled! Thank you! Oh neat! I can’t wait to track Santa this year, I think the kids will get excited! This is such a great idea. I know my granddaughters will love this. these look like fun. i will have to go check them out. i can’t believe the app is not on android yet. i will have to play it on my friends iphone or on the ipad. thanks for the great post. The donation aspect is a big perk to doing it, and I must say I want to play that cute little Santa Sprint game! I need to get this App, my girls would love it! I did not know that PNP had a mobile app! We have loved that site for years now! That sounds like a really neat app. Holiday apps are so much fun, thanks for sharing! I put this on my ipod touch.Its a lot of fun to play. I think the Portable North Pole App is so cute. I love it! The Santa tracker sounds like it would be perfect for Christmas Eve! I have been using this for years! Glad they came out with an app! This is so cool! Our daughter is three and is just starting to get into to the “magic” of Christmas and Santa Claus. An app like this would really help bring it to life! What a great app! I think I could spend all day long on my phone playing great games like this. I don’t think the kids would have a chance! What a super fun app! Great share! My kids and I love PNP! How cool, I’ll have to get this app! Oh, this looks like fun. My kids would love it! I need to get this for my son! I have no apps for him right now, and this might really help keep his excitement in check before Christmas! This is such a cute app, I think my girls would like it. I will have to check it ou. We love the Santa videos from PNP. looks like fun, my kids would love this! Haha! Just downloaded this for my kids! too fun! What a fun app! I’m downloading it now! I usually don’t pay for apps but I may have to get this one for next year.